Expanding Your Horizons (EYH) is a nationwide program that encourages middle school girls to pursue careers in science and math. 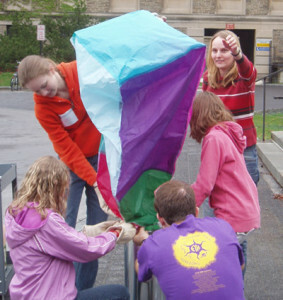 The program at Cornell invites female middle school students in 7th, 8th and 9th grade in upstate New York to spend one day a year on the Cornell campus to attend a series of math and science workshops. CCMR’s Educational Programs Office works with the graduate student leaders of EYH to administer the budget and organize over 30 hands-on workshops in science, engineering, math and technology. If you are interested in more information on EYH or would like to register for the next conference please visit the EYH – Cornell Chapter website.